Reading is an activity which, common as it is, requires some reflection to be done well. This is especially the case when dealing with reading arguments in difficult or possibly indeterminate texts. While many technical principles can be developed in connection with various kinds of texts in different genres, some principles can be seen to apply across genres, especially since they concern the morality of reading texts. Many of us haven’t stopped to consider reading as a moral act, but it is deeply so. Reading is a communicative act involving author(s), text(s), and reader(s). While I can’t delve deeply into it, one helpful image from (surprise, surprise) Vanhoozer is that of being a “citizen” of language. Language is our common realm, the kingdom, the republic within which we live and move and having our social being. As such, there are rights and responsibilities within it for both speakers and hearers, in order that we do justice to one another as fellow citizens. Once the image is in place, it’s fairly intuitive to begin filling it in. The principle of charity seeks to understand a point of view in its strongest form before subjecting it to criticism. A suspension of one’s own beliefs may be required in order to attain a sympathetic understanding. One assumes for the moment that the ideas under consideration, regardless of how difficult they may seem, are both true and internally coherent. The emphasis falls on seeking to understand the texts as they stand rather than on picking out difficulties or contradictions. If apparent contradictions are found, an active attempt is made to resolve them. Donald Davidson has suggested, for example, that the principle of charity means attempting to maximize sense and optimize agreement when it comes to doubts about the inner coherence or factual veracity of the viewpoint under consideration. If it is possible to resolve apparent contradictions (or ambiguities) through a sympathetic interpretation, a presumption exists in favor of that interpretation. A presumption exists by the same token against any interpretation that resorts to the charge of inconsistency without attempting to resolve apparent contradictions. That about sums up what I’ve seen of the principle, especially in analytic discussions. This is true both in philosophy and theology. I can recall a number of sections in Alvin Plantinga’s work where he’ll consider an opponent’s position in two or three possible forms, at times even strengthening their arguments, before going on to refute them nonetheless. This principle can also be seen Oliver Crisp’s habit–which has proved confusing to some–of considering and strengthening a number of positions he doesn’t actually hold. What’s more, considering arguments in this manner can help clarify the actual issues at stake in a given conversation. Doing your interlocutor the favor trying your best to make sense of their position means that when you do actually get around to arguing against it, it can only be that much stronger of an argument. Or, it may be that it’s only then you see the person actually has a solid point! That said, a friend of mine has also argued it’s important that this principle be weighed or balanced against the principle of accuracy. In the picture above, there is a danger that in your attempt to actually be charitable, you end up inadvertently misrepresenting your opponent anyways. Due to your own unavoidable intuitions, it may be you end up saying, “Well, they couldn’t possibly mean that, because that doesn’t make sense,” when, in fact, that’s exactly the position they do hold. Sometimes the benefit of the doubt becomes dubious. And that is a case where, despite your charitable intentions, the truth is not actually served. All the same, I know for myself, consciously striving to be charitable in my pursuit of accuracy curbs my natural tendency to read with my own blinders on. In other words, striving for charity slows me down enough to achieve accuracy. Of course, I struggle and fail–quite spectacularly, at times. Yet I would propose that principles of moral interpretation such as that of charity have become all the more pressing to adopt and practice as our internet age has pressed even more of our communication to be textually-mediated. We are constantly reading, interpreting, and engaging with the texts of other authors, other citizens of language like ourselves. If we fail to practice charity in interpretation, one of our most socially and morally formative practices, it can’t help but bleed out into other areas of our thought and life. So then, to wrap up another post that’s gone far longer than I had intended, practice charity in all your reading. Beginning with this post. Excellent!! This is a great reminder and challenge to all of us. I enjoy reading books that I do not agree with, and seeing how the ideas or topics can be redeemed in the christian life. Thanks for this post Derek. Derek, do you have any broader thoughts on the book itself? It looks rather intriguing. You know, I do, but they’re rather unqualified. 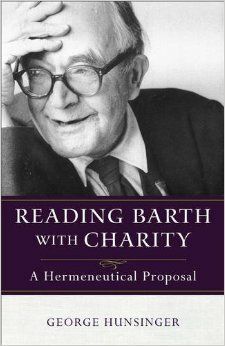 I’m not enough of a Barth guy to be able to weigh in. So far, it seems very carefully argued and textually-substantied. What’s more, I’m initially inclined to reject McCormack’s interpretation of Barth on election. I find the whole “post-metaphysical” thing confused and confusing–far more speculative than any “classical”, essentialist theology it’s supposedly replacing. But again, McCormack’s brilliant and I’ve barely scratched the surface on Barth, so take all that with a grain of salt. Well I’m further down the food chain on Barth than you are, but your response sparked an excellent evening of exploration and some discovery. Thanks for taking the time, and for the original post as well, which is the sort of thing we’d all do well to practice regularly in any context.